If comfort is what you look for in an ink pen, try one of Lanier’s Cigar Rollerball Pen. Our Cigar Rollerball pens not only are extremely easy to use, but everyone who owns a Rollerball pen finds its unique shape comfortable, and a pleasure to write with. 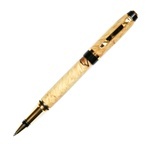 Its comfort is also enhanced by the ink pen’s aesthetic design out of exotic hardwood and trimmed in attractive 24kt gold plating. In addition to the handmade and hand polished body, our ink pens ease of use and smooth writing is complimented by the Metal Body Schmidt 5888 Safety Ceramic Tip Rollerball ink refills. When you write with one of our Cigar Rollerball pens, you’ll feel like it’s gliding across the paper making writing effortless and artistic. We have also enhanced the beauty of your ink pen by using 24kt Gold plating with black-and-gold accents and a Titanium Nitride plated nib extension for added durability. Our rollerball pens feature a removable cap that screws on to the front or end of the pen. If you’d like to personalize your Cigar Rollerball Pen for yourself or as a gift, you can also have your pen engraved, in addition to a Rosewood gift box. You can also order a matching Fountain Pen to make your gift or collectible even more special.